Whole meals that are priced per person. For larger orders, the menu item is packaged in a sealed aluminum container along with its unique side. Larger orders are delivered and served buffet style and not packaged individually. We can also prepare a custom menu for you. Still slow cooked and comforting; delivered hot and on time. Note: All the chicken on our menu is Halal. Soft and warm flour taco shell. Let us know if you need gluten free- hard corn shell. 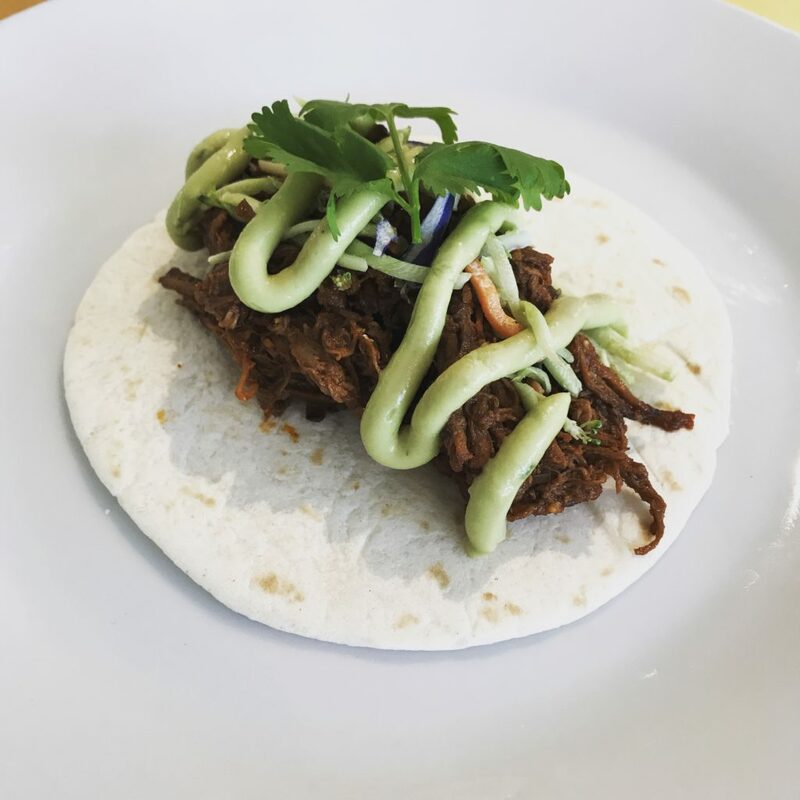 Meat: Barbacoa beef, a slow cooked brisket bursting with character, served with avocado cream to help calm down those chilies. All rendering a nice balance for your bite. – Vegan: Grilled veggie adobo w/ chipotle guacamole (grilled peppers, onions & cabbage) – $10.50. Coconut, tender Halal lamb (bone-in) with lentils, beans and vegetables. Comes with handmade mint & basil dumplings. General Tso Raging Spoon style. Tender Halal chicken cubes, breaded & fried. Then tossed in a our mild sweet and spicy house-made sauce. Served with veggie fried rice and broccoli. Two bean chipotle chili with beef, served with house corn chips on the side. Classic tandoori chicken marinated in our Indian-spiced lemon yogurt marinade, served on steamed coconut cinnamon basmati. Semi-spicy chickpeas, split peas, green lentils and onions served on a fragrant cinnamon rice. *Vegan and gluten-free.